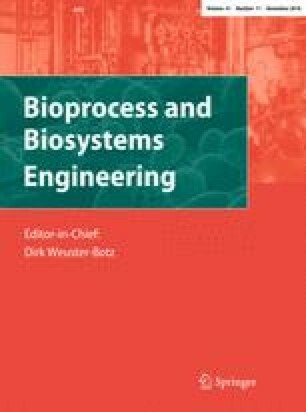 The main objective of this work was to investigate the enzymatic production of ethyl esters in continuous mode coupled to an ultrasound bath. For esterification reactions soybean free fatty acids (FFA) and ethanol were used as substrates, and Novozym 435 and Lipozyme TL IM, as catalysts. The experimental system consisted of a packed bed glass reactor immersed in an ultrasound bath and the following variables were studied: ethanol to FFA molar ratio of 1:1, 1:3 and 1:6, substrates flow rate of 2.5 and 5 mL/min, at 65 °C and 132 W ultrasound power output. It was noticed that the excess alcohol favored the esterification reaction with the best conversions observed, 95%, at 6 min reaction for 1:6 FFA to ethanol molar ratio, 2.5 mL/min feeding flow rate. Increasing the substrates feeding flow rate decreased the conversion down to 87% and replacing the Novozym 435 by Lipozyme TL IM no satisfactory conversions were achieved. This type of reactor demonstrated good performance for ethyl esters production, opening promising perspectives for use in the production of other types of esters such as those aromatic and others with high value. The authors thank CNPq and CAPES for the scholarships and financial support of this work. The authors gratefully acknowledge the technical support from Transfertech S.A and Novozymes/DK.